The Creamery, based in Manchester, United Kingdom. 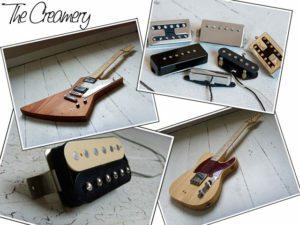 The Creamery, based in Manchester, United Kingdom, is a small one-man boutique company building custom guitars and pickups. All electric guitars are built by hand, in many cases from quality reclaimed wood. All pickups are handwound to vintage and modern specs. Many of the guitar designs are based on classic electric guitar shapes, and will be familiar to most guitar players. If you are looking for some quality hand-made pickups with amazing tone The Creamery have a large range, from Strat and Tele single coil sizes, P90s, Humbuckers, and more. The Creamery has been launching a number of new pickups over the last several months, including Swingo-Os, a Filtertron style humbucker pickup, and the “Wide-Os”, a single coil voiced humbucker. The latest pickup design is a remake of the classic Fender Wide-Range Thinline humbuckers. They will soon be available in standard humbucker sizes and traditional Wide-Range Thinline styles. The Creamery have also mentioned on their Twitter feed that they will be lanching some more new pickup designs, including some new higher output models. I’ll particularly be looking forward to them! If you are looking for a custom set of humbuckers built to your specs The Creamery can take care of you. If any of this sounds like it’s right up your alley head over to The Creamery’s online shop.